NIU School of Nursing students in the class “Population-Focused Nursing” brought health education and a little holiday spirit to some special people recently. The class, complete in holiday garb, went to the Westmont iCARE senior building on Dec. 4 and Peace Manor in Downers Grove on Dec. 6. 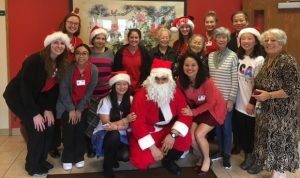 Santa and his nursing student elves showed up and provided health education material on nutrition and exercise, checked blood pressures and played some games and sang holiday carols with the residents. The visits were sponsored by United Chinese Americans chapter, of which the class instructor, Lily Chen, is the president.